Though few tourists in the United Kingdom venture farther into Wales than Cardiff or Swansea, the northern part of the country is full of rugged landscapes, bustling towns and quaint seaside communities that richly reward the intrepid traveller with beautiful sights and fun activities. The northern region of Wales is steeped in centuries of history and used to be known as the Kingdom of Gwynedd; it was the last region of Wales to surrender independence and to this day remains the stronghold of Welsh identity and the Welsh language. In addition to this cultural wealth, the region is known for its rural natural beauty and protected wilderness areas and is a wonderful destination for those wanting an active cycling or hiking holiday. 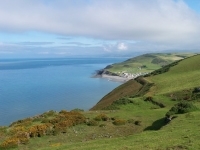 Northern Wales is home to some of the country's greatest attractions, including the rugged peaks of Snowdonia National Park and Mount Snowdon, the historical seaside town of Aberystwyth, the stark vistas of Holyhead, and the beaches of Llandudno. The region is also home to two of the three UNESCO World Heritage Sites in Wales: the Pontcysyllte Aqueduct and Canal, and the collective of Edwardian castles and town walls of the region, which can be found at Caernarfon, Beaumaris, Conwy and Harlech. We are looking for contributors for our Northern Wales travel guide. If you are a local, a regular traveller to Northern Wales or a travel professional with time to contribute and answer occasional forum questions, please contact us.